Edgar was born on February 23, 1842 in the town of Leon, New York and is the younger brother of Marshall Shannon. On September 24, 1862, he was mustered into the 154th NY as a private to serve for three years. He was wounded at the battle of Chancellorsville and participated in many of the major battles of the Civil War. 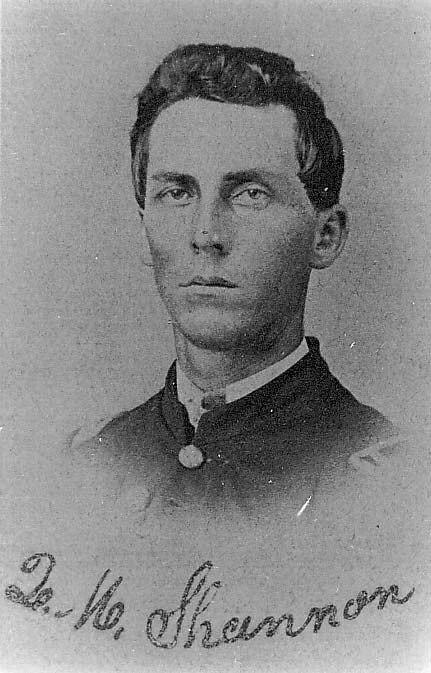 He was promoted to Sergeant in November 1863 and went on to become a 1st Lieutenant and the regimental quartermaster in March 1864. While Marshall was wounded and had to leave the regiment, Edgar stayed with the 154th to go with General Sherman and his March to the Sea. He was mustered out with the rest of the regiment in June 1865. After the war, he returned to his home town of Leon, NY where he went on to own a business. He became very successful and was elected as the town superviser five times between 1869 and 1882. In 1876 and 1877 he was elected as the Republican Assemblyman from the Second district of Cattaraugus County. Edgar died on December 28, 1882 and was laid to rest in the Treat Memorial Cemetary in Leon, NY. Many years later, letters Edgar had sent to his sweetheart during the war surfaced. They have been referenced within a book, Brothers One and All: Esprit de Corps in a Civil War Regiment, and articles written by Mark Dunkleman. His words will live on and he will not be forgotten.